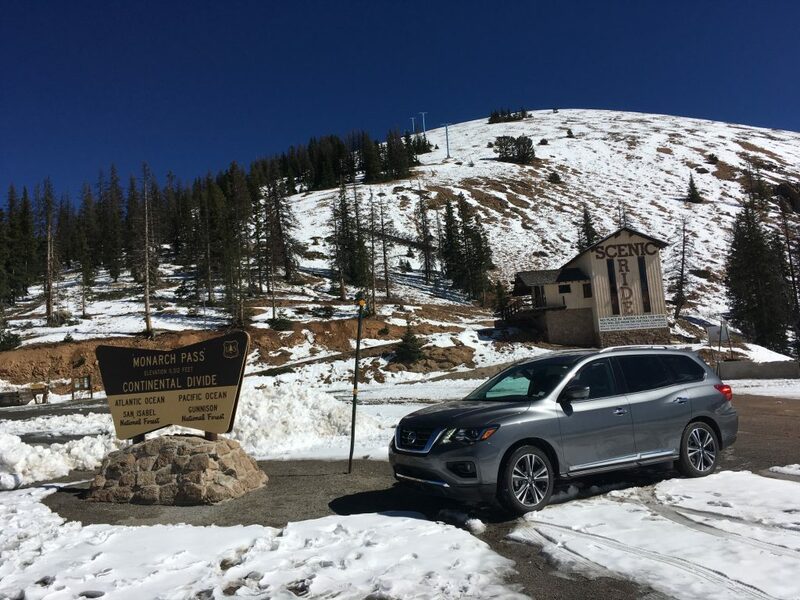 After a Colorado road trip this winter, we were pleasantly surprised by how much we loved the new Nissan Pathfinder. Updated for the 2017 model year, the Pathfinder, which was first introduced in 1987, is now in its fifth generation with subtle interior and exterior updates as well as a host of features. 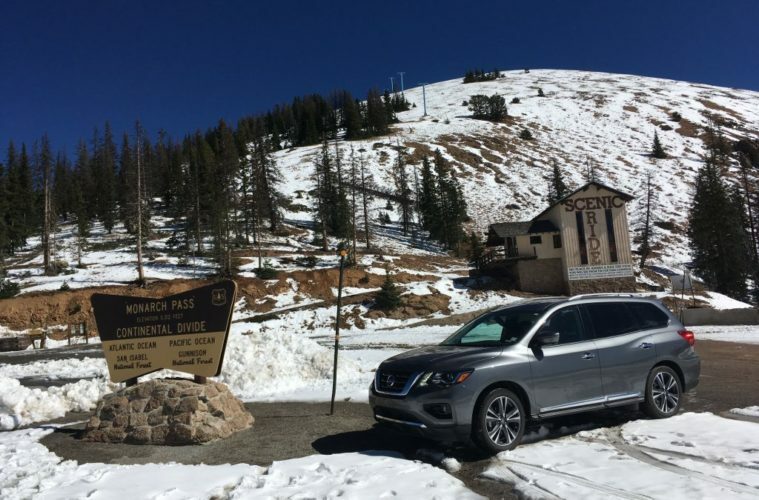 Especially on the 2017 Nissan Pathfinder Platinum we were loaned for this test. 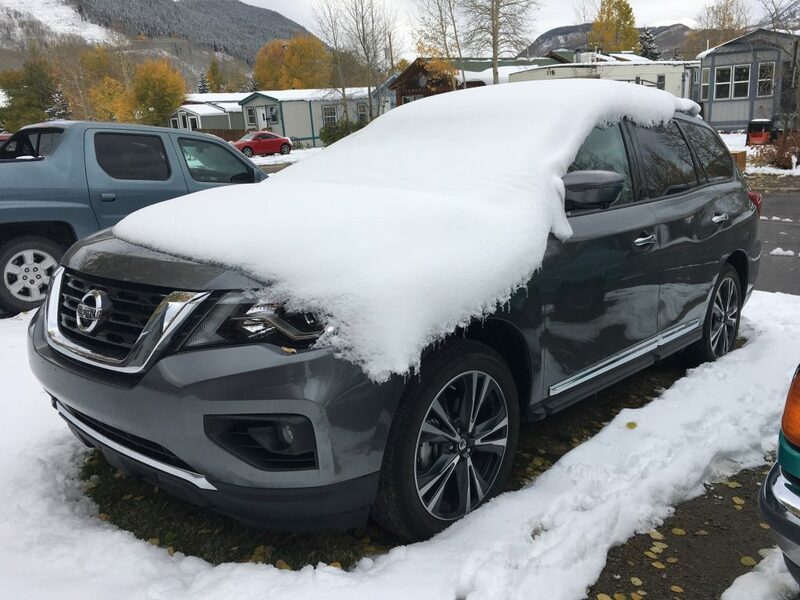 Our family of four (kids of 6 months and 3 years) fit very nicely into the 2017 Pathfinder with car seats and all the gear we needed for a four day winter trip to Crested Butte from Boulder—just short of five hours without stops. We had stops. 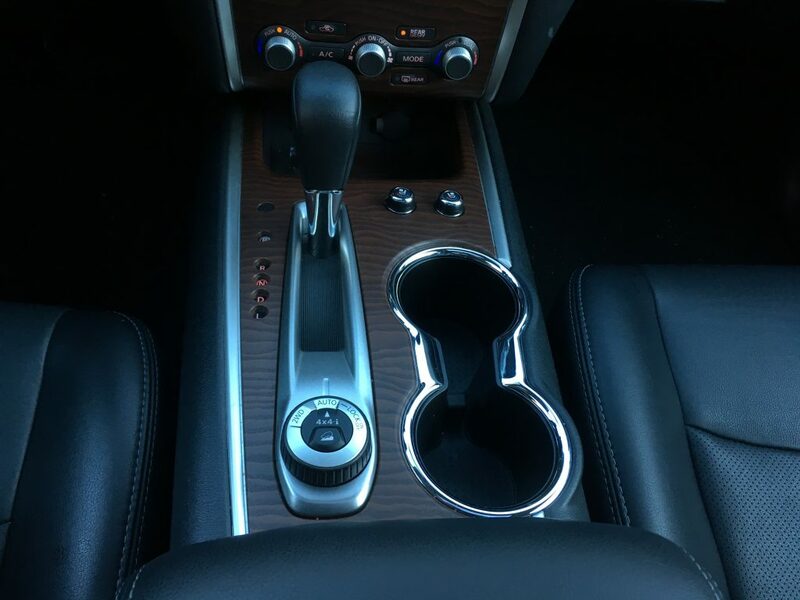 The very first thing we noticed about the Pathfinder while running errands around town to get ready for our trip was how smooth it is. The suspension is reportedly a little stiffer than the 2016 version and we found it to be an excellent balance between being able to ride smoothly going fast on the freeway and minimizing body sway when taking sharp corners on the standard 20-inch wheels. The steering, which is a half hydraulic, half electric system is tight without being twitchy. 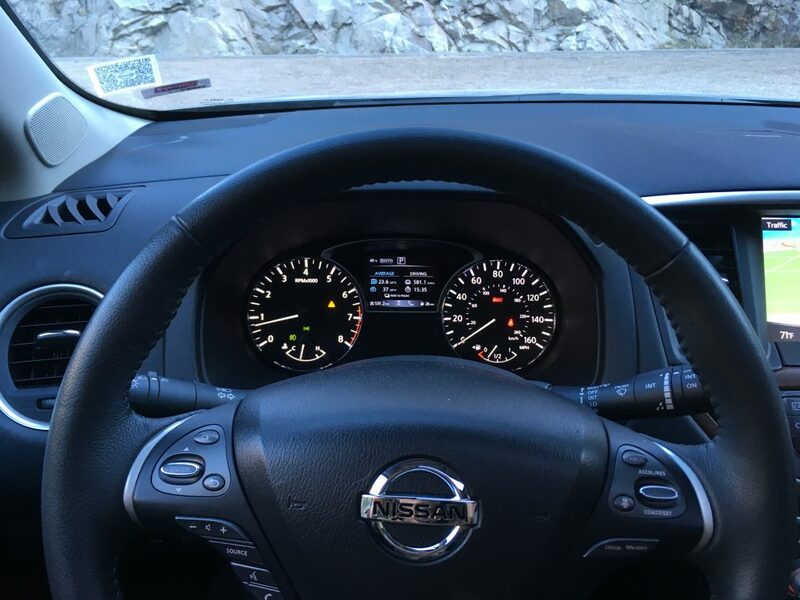 It’s very easy to drive either around town, along windy mountain roads or on long Interstate stretches. Unfortunately, we only had a very short stint of dirt road to get to some hiking trails once we were in Crested Butte and it did fine. No sharp or jarring jolts as we rode over the few bumps along the way. It only has seven inches of ground clearance, which is fine for dealing with snowy roads and moderate dirt roads. My preference would be to test it a bit more along gnarlier roads. Outward visibility is good for today’s vehicles (not great compared to older vehicles like my 2000 4Runner). 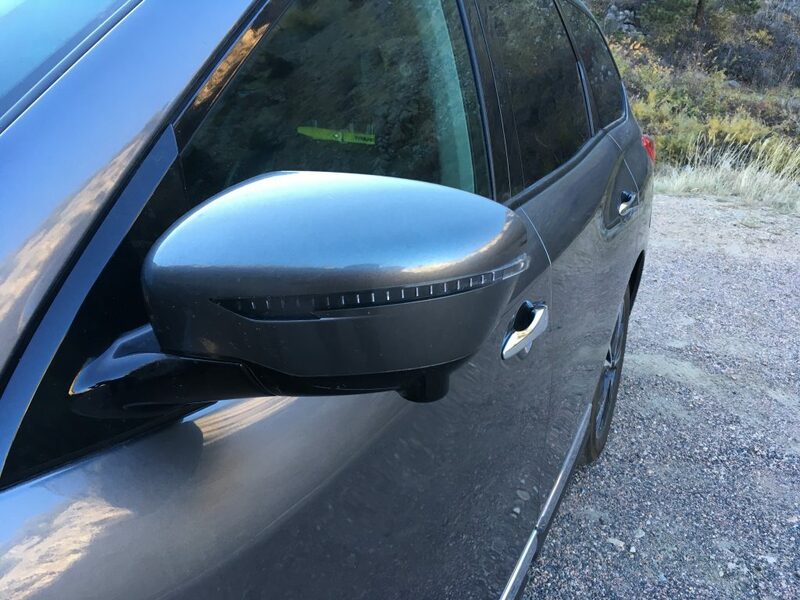 The basic trim package includes the standard rear facing reverse camera while the Platinum we had included their 360-degree surround view parking camera system. This is pretty trippy, but once understood it’s also pretty amazing. It also includes moving object detection which proved its worth a few times. The 360 degree surround view. The DOHC 24-valve V-6 engine with aluminum block and heads and direct fuel injection cranks out a very useful 284 horsepower (@ 6400 rpm) and touts a 6,000 pound towing capacity. That’s pretty darn good for this class of vehicle. We didn’t need to haul a trailer or attach a roof-top box for our trip to CB since we had 47.8 cubic feet of cargo space with the third row of seats folded down. That proved to be plenty of room for all of our luggage and winter gear for four days in Crested Butte. Skiing was not on the agenda this round and for that we would have needed to strap the sticks to the roof—those were not going to fit in the vehicle with all the humans. With all three rows of seats up, the cargo space is reduced down to 16 cubic feet, which isn’t horrible, but the versatility offered to switch back and forth can be very valuable for bringing our kids’ friends along (when they’re older and we are out of car-seat land)—a worthy note to a young family considering a new vehicle. If we owned this Pathfinder, the third row would mostly stay folded down until we needed to haul more people. 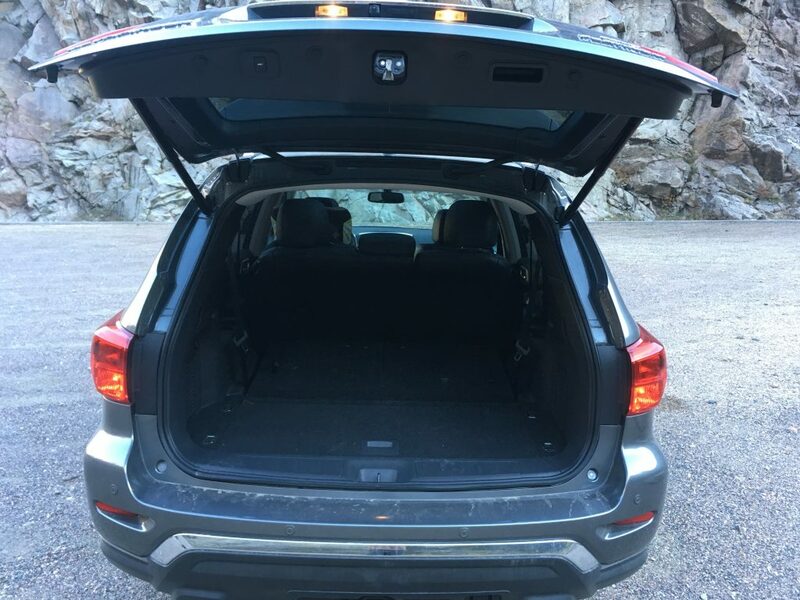 To go kidless on an adventure, we could put the third and second row of seats down for nearly 80 cubic feet of cargo space. Go figure the EPA decided to adjust how it measures fuel economy in 2017 so comparing to pre-2017 numbers will be a little off. 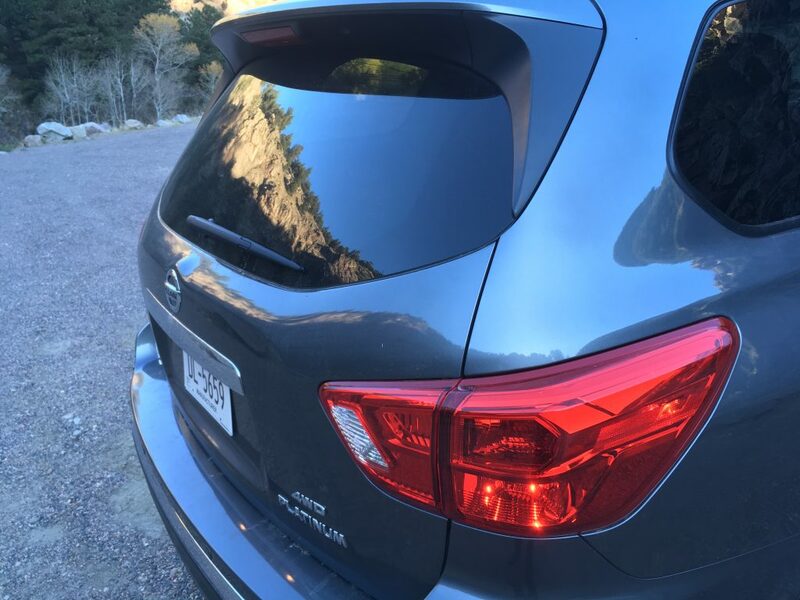 Nevertheless, the EPA gives this vehicle a combined rating of 21 mpg, but as you’ll see in the photo the car calculated itself at 23.6 mpg after nearly 600 miles of travel from Boulder to Crested Butte and back plus some running around town. Granted, since I didn’t need to completely refill the tank I wasn’t able to get my own calculation of the mileage. But from my past experience the trip computer and my calculations were never more than 1 or 2 mpg different anyway. 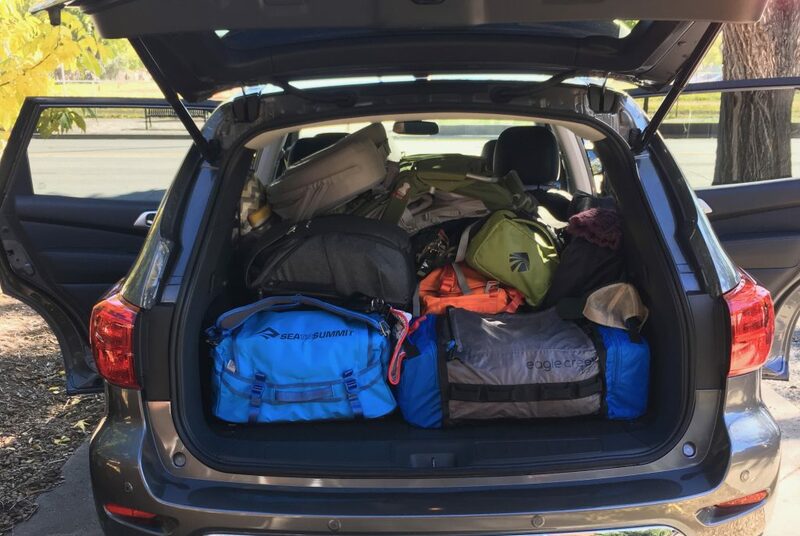 Remember, this was also with a full load of people and gear packed full into the back cargo area traveling through the Rocky Mountains—not some empty car going downhill with a tailwind kind of trip (that might be how they got 26 mpg for their highway rating). For the size of the Nissan Pathfinder, the versatility of cargo and human hauling and the towing capacity, I’d say that’s a pretty good efficiency rating. Media loan vehicles are usually one of the upper trim packages and having Nissan’s 4×4 Platinum fell right inline with that. There are eight different trim options and we had all the bells and whistles. 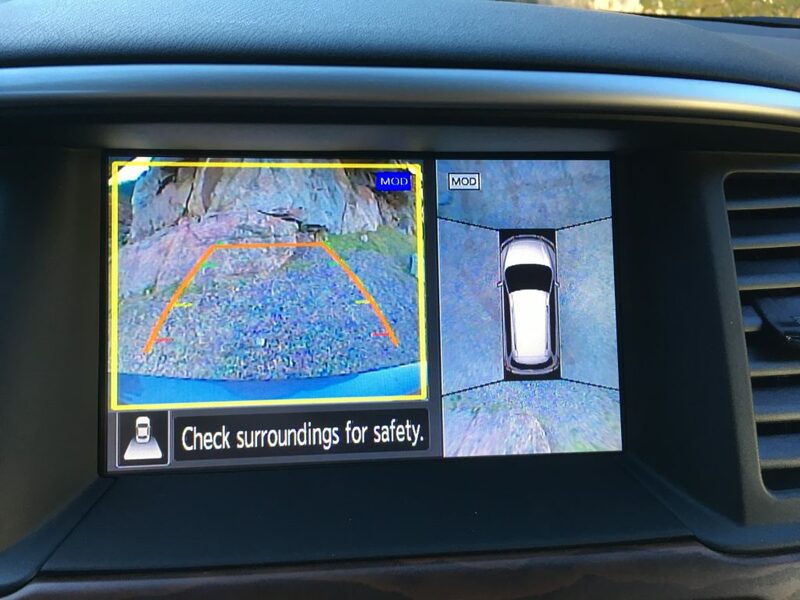 One of the cool features as mentioned above is the surround view which provides a synthsyed overhead view of the vehicle compiled from cameras looking out from all four sides. One of the down sides of our experience was not being able to get the app and remote start and related features to work. 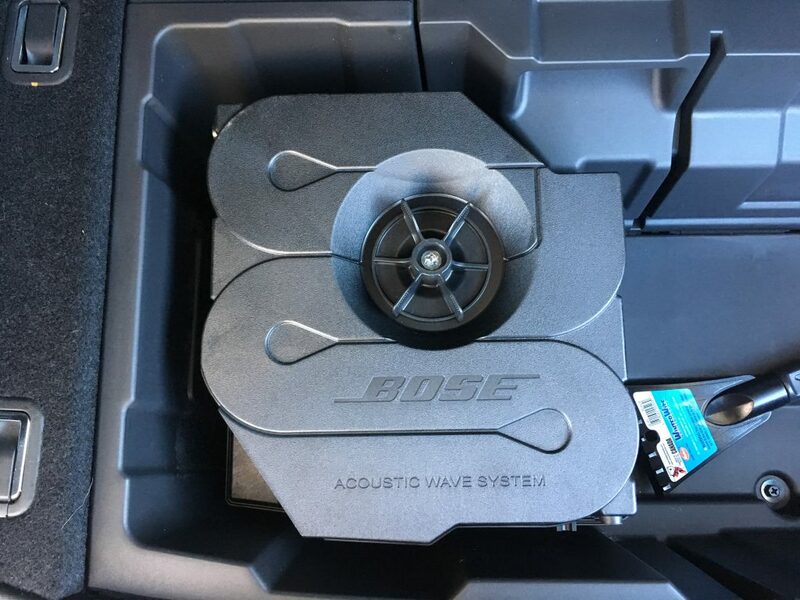 It’s through the NissanConnect App through the Sirius XM system. It may have been because it was a loaner and not representative of what a new owner would experience. It just wasn’t as intuitive as the Chevy or GMC apps we’ve used in the past. 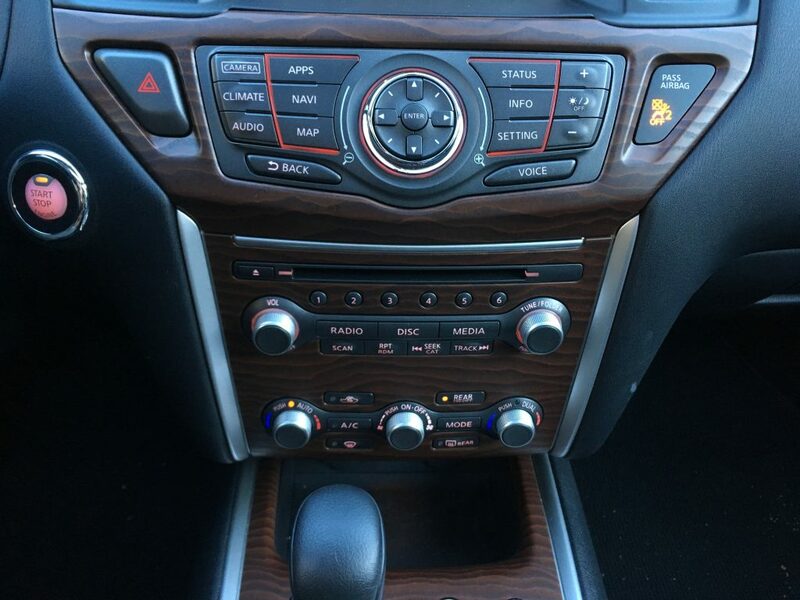 Again, at the Platinum trim we were blessed with leather heated or cooled seats so those were very comfortable. But part of that comfort also comes with any trim level as the interior is a nice shape and doesn’t feel cramped in any way. With that, all the sightlines looking out from the vehicle were clean and unobtrusive which avoided any inclination of carsickness from any of our passengers. On the other hand, it’s not overly roomy either (though few complain about that). It’s a vehicle we could be very comfortable in for trips longer than ours to CB and back. With that came the well balanced suspension as covered in the Handling section above. Over all, a very comfortable ride. 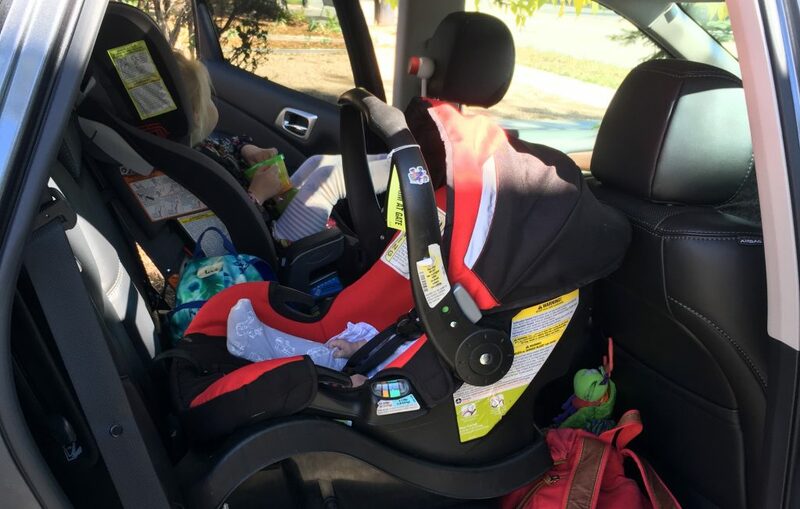 With three rows of seating as standard, and a unique second-row bench that can tilt and slide with a full-size child’s seat attached, the Pathfinder remains one of the segment’s most family-friendly models. The only thing really missing in this category was a rearview mirror that provided the full rear seat view and the retractable sunshades for the back seat windows (though it does have tinted privacy glass). A fun stop at Monarch Pass.